Borrow eBooks, eAudiobooks, eMagazines, eReaders, and more! Use your library card to borrow eBooks, eAudiobooks, eMagazines, and more through our Overdrive collection and enjoy them on mobile device or computer. Try OverDrive’s new app Libby, the easiest way to get started with digital books and audiobooks. Choose a loan period of 7, 14, or 21 days and never worry about late fees, since titles are returned automatically. 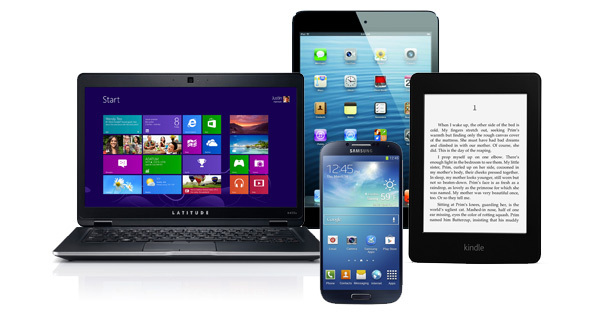 Compatible devices include iPad/iPhone/iPod Touch, Nook, Kindle, Android phone/tablet and more. Visit Overdrive’s Device Resource Center for a more complete list of which devices are compatible with the formats available. Instantly stream eBooks, eAudiobooks, comic books, movies and tv series on your mobile device or computer. The loan period is 21 days. Borrow a maximum of 4 titles per month (monthly limit resets on the 1st of the month). Download the Hoopla Digital app on your mobile device, or access hoopla on your computer using a browser like Internet Explorer, Firefox, Chrome, or Safari. There are no waiting periods or late fees, and titles return automatically. For more information, visit hoopladigital.com/help or contact the Library. RBdigital Magazines, the world’s largest newsstand, offers full-color digital magazines for anytime, anywhere reading on desktops, mobile devices, and apps. 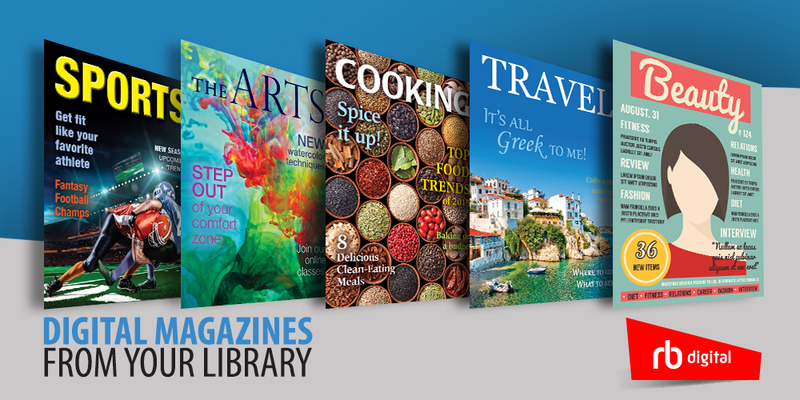 The collection of popular digital magazines includes both new and backlist titles with no holds, no checkout periods, and no limits. You can instantly access all current and backlist magazines on your desktop and mobile browser, or use the RBdigitalapp to download and read magazines on 95% of today’s mobile devices, including iOS (Apple®), Android™, and Kindle Fire™/HD/HDX. For more information, visit RBdigital’s FAQ page or contact the Library. TumbleBooks are animated, talking picture books which teach kids the joy of reading in a format they’ll love. TumbleBooks are created by taking existing picture books, adding animation, sound, music and narration to produce an electronic picture book which you can read, or have read to you. It also includes National Geographic videos and games. TumbleBook Library is compatible with most computers, tablets, and smart phones. However, your experience on the site may differ a little based on your device. Every user logs into TumbleBookLibrary, but you should be redirected to one of the mobile websites if you’re on a tablet or a phone. Don’t have a device? The Library has several types of eReaders you can borrow. Our Nook Simple Touch devices and our Kindle Keyboard device all have books preloaded onto them, ready for you to enjoy. You can also request specific titles if they are available in our Overdrive collection. Titles in the Overdrive collection may also be requested for our Sony Reader. Nooks- There are 5 Nooks available for checkout for a period of 2 weeks. For more information on how it works, please see our eReader form, which all users must sign. View a list of titles preloaded onto all our Nooks. Kindle- There is 1 Kindle Keyboard available for checkout for a period of 2 weeks. For more information on how it works, please see our eReader form, which all users must sign. View a list of titles preloaded onto our Kindle. Sony Reader- There is 1 Sony Reader available for checkout for a period of 2 weeks. For more information on how it works, please see our eReader form, which all users must sign. The Library has 4 Nook HDs available to check out. Borrowers must be at least 18 years old and must sign our Nook HD Borrowing Agreement. The loan period is 2 weeks. The Nook HD can be used to surf the web from anywhere there’s a wi-fi connection. Need help? Attend one of our upcoming classes, or bring your device in to the library. We’ll take you through the setup process and show you how to download books.